Errol Flynn, Olivia de Havilland, and director Michael Curtiz had worked together before teaming up for Warner Bros.’ lavish 1938 film The Adventures Of Robin Hood, most successfully on Captain Blood and The Charge Of The Light Brigade. They’d make classic films together in the years ahead, too, like The Sea Hawk and Dodge City. 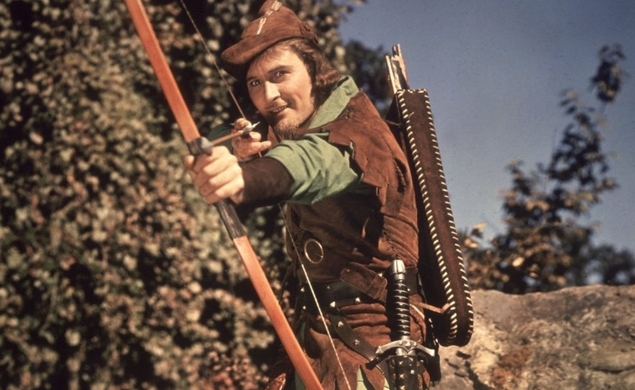 But in terms of sheer entertainment value, The Adventures Of Robin Hood is the apex of their collaborations—and one of the crown jewels of the studio era. It’s a film where everything that could work did work, despite a production turbulent enough to require Curtiz to step in for original director William Keighley (who still gets a credit). The three-strip Technicolor—Warners’ first attempt to make a film with that process—looks richer than life. Flynn, who did many of his own stunts, looks every inch the dashing hero. De Havilland plays Maid Marian as a woman as willful as she is beautiful. And the supporting cast gets rounded out by Claude Rains, Basil Rathbone, Alan Hale Sr. and others. It’s paced at a gallop, too, and balances a light tone with a sense that Robin and his merry men are all that keeps England from falling into darkness. Other versions of Robin Hood have offered grittier, more thoughtful, and more Bryan Adams-filled takes on the character, but none have topped this one. It airs today on TCM at 4:30 p.m. Eastern.